This is a datapack that adds a plethora of advancements and recipes for your survival world. It is currently updated for 1.13.2 and there is a beta for 1.14 Pre-Release 3. A Spanish version of the pack is available for "platypack19w03c", Italian is available for "platypack1.13.2 V2" and the 1.14 snapshots. Chinese is available for "platypack1.13.2", German and Portuguese versions are available for "platypack1.13 V2" and Russian is available for "platypack1.13" under the "Files" page. Click the respective file. The download is toward the bottom, under the changelog. Translation credits can be found below. Many thanks to the translators! If you want to use this datapack for anything other than a singleplayer world, read the spoiler at the bottom of the page. This pack contains 303 advancements and 13 tabs (356 advancements and 14 tabs in the beta). They consist of Vanilla's existing advancements, brand new advancements, remakes of old achievements, and achievements exclusive to Bedrock/Console versions of the game. Some advancements were taken from another pack. Credit and a link to the pack can be found below. Many thanks for these creators for helping make this pack what it is! Basic info about the different tabs can be found here. Click here to see a table of all the recipes I have added or tweaked. All the recipes have in-game unlocks, just like the Vanilla recipes. Do not bother asking for permission to edit/comment on the spreadsheet. You have no reason to and your request will not be granted. If you wish to play the pack with just the advancements, a version without recipes is available for download under the "Files" tab. Click the most recent file and scroll down to the bottom. Under the changelog should be the download. There is a second sheet for beta versions. The "<world save>" is whatever your world's file is named. There is no need to unzip or unpackage anything. Thank you for all the work put into translating this massive project! Credit goes to Cobaas, Cavinator1, and MichaelMKenny for the advancements in the spoiler. Although I may have tweaked them slightly, they originally came from them. Thanks for helping make this pack what it is! Here's a link to their pack if you're interested. Light it Up, Up, Up! More Dragon-Proof Blocks is a pack that increases the number of blocks the Ender Dragon doesn't destroy. Silk Touch-less Campfires is a pack that makes it so campfires will drop themselves when mined, even without silk touch. There are a lot of tags in this pack that are used internally. All the custom tags are used somewhere in the pack. Click here to see a spreadsheet documenting the tags, what they contain, and where they are used. These are only used in beta versions currently. The document can be found here. Only for 1.14 betas. You may use some of my advancements, recipes, or tags in your own datapack. However, if you distribute this pack, you must clearly credit me for the content you used, even if it has been edited slightly. You must also link to this page. You may use this datapack on your server. However, if your server has any sort of website, forums, etc, you must clearly credit me and link to this page. If your server has none of those, just inform players of this page if they inquire. You may use this pack in a video or series. However, you must provide a link to this page in the description of your video. Distributing this pack, or parts of it, without building on it significantly is not allowed. You must also message me for explicit permission. Please, leave a comment about what you think could be changed, tweaked, or added. All constructive criticism is helpful and welcome! Report issues under the "Issues" tab! Thanks for downloading and helping me improve this! Follow me @PlatyPack on Twitter to see development updates and such! I downloaded the 19w11a version and replaced the 19w09a version I had, deleting the old file once the new one was in place, and now my progress for Adventuring Time is gone. Oh well. Just warning any fellow completionists out there. Yeah sorry, it's just something that comes with the unstableness of the snapshots. I'm sorry your progress was lost. How can I get the platypack 1.13.2 V2 version in Portuguese without recipes? If you can not get this translated version, I'd be happy to help translate version 1.13.2 v2 and future versions (1.14), I'd be happy to help translate! Hey, I noticed some of the vanilla advancements have extra criteria in this datapack. 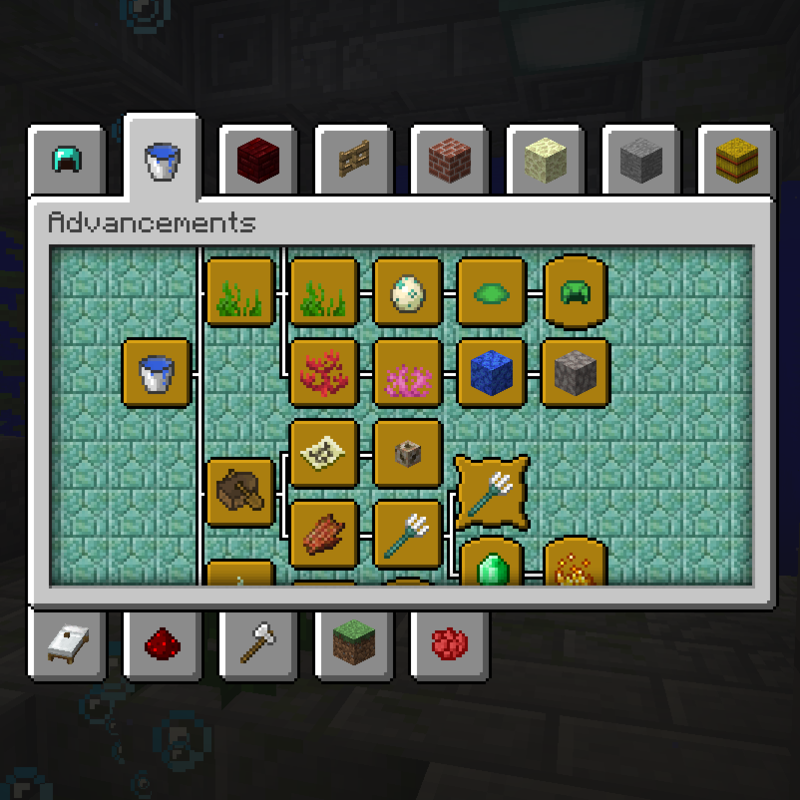 (Adventuring Time has two extra biomes, A Balanced Diet has two added food items, etc.) Can you inform me of all of what you've added to the vanilla "Do all of this specific thing" advancements, please? Here's a document detailing all that. Adventuring Time has no extra requirements in my pack. Oh, thanks. Looking back at my observations, I was merely confused that the wiki said that you need to go to 36 biomes but the game said i had 12/38. Now that I'm double-checking, the wiki even says that in 1.14 you also have to go to the two bamboo jungle types. Can you add a recipe for scaffolding where you can use sticks instead of bamboo, because I rarely see jungles and want to use the new block to help with building. I'd rather not add it to the pack, but I can make that recipe and send it to you if you'd like! Yeah it'll be pretty easy. I'll send it to you in a few hours once I'm no longer busy! Is anyone translating this to Spanish? If not, I'd like to. No one has contacted me about it. Go ahead! Thank you! And how do I send it to you? Could I upload it to mediafire and PM you? Hi! If I translate your advancements to polish, where can I send you the translation so you can use it? Upload the advancements to a file sharing service, such as Mediafire or Google Drive, and PM me here on Curse with a link to the download! Location: Why do you need this? I'm translating your advancements, but I don't know the meaning of this: Pariahs(The enter a magion advancement). The translator didn't help at all. Help please!